If you are in the position of looking for a party bus in Sterling Heights, then your initial search is finally over. 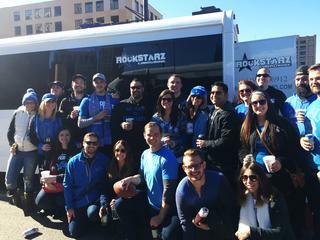 Here at Rockstarz Limousine and Party Bus, we specialize in providing our clients with the most amazing party bus experience ever, and we do so no matter the occasion that you find yourself celebrating. Whenever you wish to rent a party bus, you will want to know in advance that you can invite each and every guest that appears on your list. With us, we have sought to make the best possible use of the space on our bus in order to allow you to invite even more guests than ever before making sure that everyone is capable of having a wonderful party. Our Sterling Heights party bus rental option is designed in such a way so as to give our clients the impression that they are indeed on their own private nightclub. That is something that will become apparent from the moment you all step on board making this the perfect way to cruise around the city. Whether it be the sound system that blows your mind as it blasts the music throughout the bus, or the light display that transports you into your own nightclub, we know that this is a party bus that will exceed your expectations. Not only that, but with a professional driver at the helm to look after your needs, this will be a true one off experience. People have taken advantage of our Sterling Heights party bus service to help them with a number of different kinds of celebrations. No matter if it is for a birthday, an anniversary, or a last party before you are married, we can help. So, if you do live in the Sterling Heights area and are looking for a party bus, then give us a call here at Rockstarz Limousine and Party Bus. Alternatively, you are able to contact us via our website and someone will then be in touch as soon as possible.